See our photo gallery for the past events! 2019 Valentine Dog Day! Pet Wash fundraiser to benefit Furry Friends Rescue! Get your furry sweetheart spiffed up for Valentine's Day and year round! IMPORTANT: Please print or show this flyer to PFE cashier from your phone when you purchase PFE Pet Wash Tokens on Valentine Dog Day. Thanks! Great deal! Stock up! Squeaky clean gift for your dog loving friends. Get a Raffle ticket to win a basket from Pet Food Express! Tokens never expire and can be used at any Pet Food Express location. 100% Pet Wash proceeds go to FFR. Purchase Pet Wash Token and get a Raffle ticket at FFR table, to win a basket from Pet Food Express. *Cat showcase only at Fremont location. Doggie Kissing Booth! $1.00 donation. Get kisses from a furry pup! Download flyer of this event. Please share! DSLR photos with Santa or Christmas backdrop. Includes one sitting, a 4x6 print in Holiday Frame Card and original photo download (for print use). Donation of $5 appreciated if more than 1 pet or person per sitting. Additional photo print $5 or $10 with Holiday frame. View photos from past year! Oct. 27, 2018 Howl-O-Ween Dog Costume Contest at Town Fair Plaza! Thanks for coming! Enjoy fun photos from this event! Get your Doggie Costumes ready! Download event flyer and please share! Dog Parade, Costume Contest, Dog Adoption Showcases, Raffle, Dog Vendors, Dog Treats, Food Trucks, Music, Games, Karen Smith, Alameda County Search and Rescue Demo (SAR) and More! Ample FREE parking. More details to come! Check out Town Fair Plaza event page or Facebook event page. See you on Saturday, Oct. 27, 2018, 4:00 - 9:00 pm @ Town Fair Plaza! Dog must be friendly, vaccinated and on leash (6 ft & under). Sept. 23rd, Woofstock 2018 at Jack Rose Libation House! Kids 10 yrs and under FREE. 18840 Saratoga Los Gatos Rd. Download event flyer (pdf). Please share! Dress up your inner hippy! Join us for a very groovy day of outtasight Live Music, food, drinks, Hippy Dog Costume Contest, Raffles and Woofstock fun with your dogs! Big Woof Thanks to our groovy Sponsors & Donors! 2018 Valentine Dog Day! Pet Wash fundraiser to benefit Furry Friends Rescue! Great deal! Stock up! Squeaky clean gift for your dog loving friends. Get a Raffle Tix to win a basket from PFE! Tokens never expire and can be used at any Pet Food Express location. 100% Pet Wash proceeds go to FFR. Purchase Pet Wash Token and get a Raffle Tix to win a basket from Pet Food Express. Dec. 9th, Pet Holiday Photo with Santa Paws! Ho, Ho, Ho! DSLR photos with Santa or Christmas back drop. Includes a 4x6 print in Holiday Frame Card and original photo download (for print use). With photo purchase, you will get a 20% off coupon from Pet Food Express! View photos from last year! Download flyer for this event & share! ...AND MORE! Don't dare miss out on this terrifically terrifying evening! 8:00pm Gather those last minute trick-or-treating goodies! 100% of proceeds will be donated to animals in need! If you're interested in being a vendor at the event and/or donating to the silent auction, please complete this Google form. To keep my pet on a leash of 6 feet or less at all times. To assume responsibility for my and my pet's actions. That my pet has all appropriate vaccinations. To scoop my dog's waste. That there are no refunds since all proceeds will be donated to charity. Furry Friends Rescue ALOHA DOG 2017 in Los Gatos! See many pawsome photos of this event! Break out your Hawaiian shirt or grass skirt and get your dog ready! Mai e `ai (come & eat) and relax! Enjoy and relax with Hawaiian music, hula dancers, delicious food, brew, Mai Tai, and Tiki drinks! Yappy Hour tropical dog treats! Please download flyer (PDF) and help spread this pawsome event! Contest MCs: "Nick & Kristen In The Morning" on 96.5 KOIT. VIP Judges: Dani Brozowski from Waggin Tails Pet Supplies, Dr. Tama from Tama Veterinary Hospital and Kris from Tito's Handmade Vodka! $5.00 adult. Kids under 8 years old: Free. 2017 Valentine Dog Day! Pet Wash fundraiser to benefit Furry Friends Rescue! Valentine on-site photographer (Saratoga store ONLY). Get a beautiful photo print (4x6) of your sweetheart in a "Valentine" frame! $15.00 (We can also e-mail you a digital copy as a keepsake). DSLR photos. 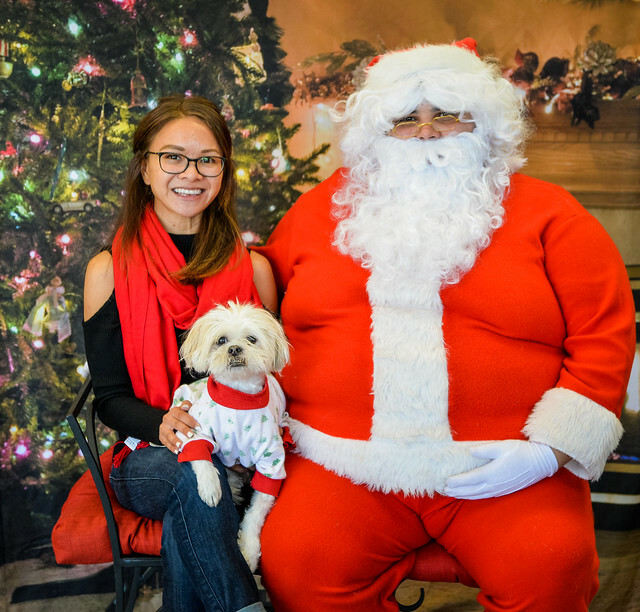 Pet Holiday Photo with Santa Paws! Ho, Ho, Ho! Howl-loween Dog Costume Contest @ Big Dog Vineyards! Check out awesome photos on our Flickr or Facebook from this event! SOLD OUT! There will be no ticket sale on site. Cutest, Funniest, Scariest, Group, Best Treat for Trick and Grand Prize for Best. Big Woof Thanks to our paw-some Sponsors & Donors! Feb. 13, 2016 Valentine Dog Day! Pet Wash fundraiser to benefit Furry Friends Rescue! Download printable flyer of this event. Help us spread the word! Valentine on-site photographer. Get a beautiful photo print (4x6) of your sweetheart in a "Valentine" frame! $15.00 (We can also e-mail you a digital copy as a keepsake). DSLR photos. Valentine goodies and dog treats. Woofstock & Walk 2015 Howl-loween Dog Costume Contest on Oct. 18th at Sanborn Park, Saratoga! Thanks to everyone who joined us and donated! We had a super fun & groovy dog day! Watch Woofstock 2015 & Walk Video! Sanborn County Park is located on Sanborn Rd. From Saratoga, proceed two miles west on Highway 9 to Sanborn Rd. Turn left onto Sanborn Rd, traveling one mile to the park entrance. Parking: $6.00 (Try to carpool to save parking spaces). If need: Additional parking will be set up at Saratoga Springs with shuttle service. Entrance: $10.00 Adult-Teen (Advance), $15.00 on day of Woofstock event. Kids 10 years & under are FREE. Woofstock Walk: $30 Walk Registration (Advance), $35 on day of Woofstock. *This include entrance fee. FFR areas: Lawn field between Costanoan, RV camping & Ohlone, areas. Lawn area seating. Bring your blankets or portable chairs! Picnic Tables available. Beautiful clean park with forest trails. Nestled in the Santa Cruz Mountains between Saratoga and Skyline Blvd. Back to Nature! Park has limited cell service with Verizon. Please bring cash or checks for FFR purchases. Food Trucks will need cash. Woofstock Walk! Online Fundraising! Create Your Team & Share! $30 Walk Registration (Advance), $35 on day of Woofstock. *This includes; Entrance Fee, Awesome Woofstock Tie-Dye T-shirt, Swag bag (dog goodies) and Dog Costume Contest. Order your Walk Ticket(s) now so we can save you a limited Woofstock Tie-Dye T-shirt for you! See the photo from our past FUN walks! Your pledge will directly changes the lives of dogs & cats we rescue! See the difference you can make at our Purple Heart Miracle Club page. Start at Woofstock Field to Sanborn Trail, walk past the campgrounds to Peterson Memorial Trail around and down to the San Andreas Trails back to the Dyer House Visitor Center area back to Woofstock field. The total loop is 1.6 miles or 2.6K. You can choose you distant and turn around at 1K. Fun hike with your friends and dogs! Once you are on the Pledge page, you can donate by clicking the orange "Donate" button OR create your own fundraising "team" by clicking the grey "FUNDRAISE FOR THIS CAMPAIGN" button on the bottom right. You can encourage your family, friends & co-workers to donate so we can save more animals. Thank you! $10.00 Adult-Teen (Advance), $15.00 on day of Woofstock event. Kids 10 years & under are FREE. *We have corrected the link issue for Firefox & Internet Explore. You should be able to click the button to purchase the ticket now. Please print this Registration & Waiver form and turn in signed at Woofstock. Join us for a super Groovy day! 11:30 am: Nature Trail Dog Walk. Walk 1K or 2.6K. Optional distance. It's up to you. :) *All dogs must be on leash (6 ft or less), 4 months & older with current vaccinations and friendly. Grooviest Hippy, Cutest, Unique, Funniest Group & Best Trick!. Grand prize for Best! Halloween Dog Fun: Bob for Treats, Trick for Treats, & more. Great Swag goodies, Wine Tasting, Food Trucks, and more! Contest for Best Woofstock Decorated Booth! Complimentary photo download & profits from sale of any prints will be donated to Furry Friends Rescue. Raise walk donation pledges to help save homeless dogs & cats and special vet needs for our "Purple Heart Miracle Club" dogs & cats! Download Woofstock flyer and spread the word! Celebrate, relax and have fun with your dog or dogs! Dress up your inner hippy! Get your dog's costume ready for our super Howl-loween Dog Costume Contest with great prizes! More details TBA soon as our volunteers work on all details. Please save the date and share! Thanks to our donors to Woofstock! 2/14/2015 Valentine Dog Day! Pet Wash fundraiser to benefit Furry Friends Rescue! Great deal! Stock up! Squeaky clean gift for your dog loving friends. Valentine goodies and dog treats from The Honest Kitchen. Join us for a fun Christmas festival! Downtown San José at the Plaza de Cesar Chavez on Market St. between San Fernando and San Carlos St. Two-acre park is transformed into a holiday fantasy! Free entrance. No dogs allowed thru park. Tivo Santa Run Ho, Ho, Ho! Dog & Cat Showcases @ "Santa Paws House"
Saturday, Dec. 6th, Holiday Pet & Family Photos @ Wag Hotel! Holiday Pet & Family Photos! Funds benefit Furry Friends Rescue dogs & cats! DSLR photos with Christmas back drop. Includes 4x6 print in Holiday Frame Card and original photo download (for Holiday print use). Meet our Home Fostered pups & dogs! Enjoy Holiday music and snacks. Oct. 30th, Haunted Howl-o-ween @ Wag Hotels to benefit Furry Friends Rescue! Join us for a spooky for a Haunted Howl-o-ween at Wag Hotels to benefit Furry Friends Rescue! Saturday, Oct. 25th, Howl-o-Ween Dog Costume Contest @ Pet Food Express Los Gatos! Costume Contest: Scariest, Funniest, Best Owner,Dog look alike, Most Creative. Furry Friends Rescue﻿ Dog Showcase &Raffle. Prizes from Pet Food Express. Costume Pooch Parade in Los Gatos Village Square. All proceeds from contest event benefit Furry Friends Rescue! Woofstock 2014 On Oct. 19, [email protected] The Mountain Winery! Thank you for coming to Woofstock 2014! Wow! Check out the beautiful photos from MrHoni Photography!!!! Online photo gallery from our Woofstock 2014 is ready for your viewing pleasure! Visit their website's Woofstock page or www.mrhoni-photography.com and click on Woofstock, which is near the top of the page under Special Events Galleries. Prints can be purchased from MrHoni Photography and all profits will be donated to Furry Friends Rescue. Photos can be downloaded for sharing on social media, emailed to friends and family, saved on your phone/tablet. Join us for a very groovy day of Wine Tasting, outtasight Live Music, Howl-loween Dog Costume Contest, great booths and Woofstock fun with your pets! Wine tasting will be located at their outdoor plaza, boasting breathtaking views of the Silicon Valley. Enjoy the beautiful vistas of the Winery while dancing or listening to cool woodstock music from awesome live bands, Howl-loween Dog Costume Contest, Silent Auction, Raffles, Yappy Hour goodies for your dog, Dog Showcase and special guest artists/vendors. Mingle, relax and have fun!. Peace, Love and Rescue! Check out last year's Woofstock video and photos! Help raise much needed funds to save abandoned Dogs & Cats and FFR's Miracle Club! More groovy Information to come! Entrance Fee includes: Complimentary taste of 4 Reserve Wines (valued at $10) or soft drink. Selection of quality dog treats (value up to $20). Entrance in our Howl-loween Dog Costume Contest! Wine, beer, non-alcoholic beverages and food will be available for purchase. Parking is FREE. Download this event flyer and share it with everyone! Grooviest, Cutest, Funniest & Group! Grand prize for Best! Special Guest Emcee, Diane Dwyer, NBC Bay Area News and VIP Judges, Charly Kayle, 96.5 KOIT San Francisco, Dawna Caldwell, Trainer @ Happy Tails to You Dog Training! Yummy Honest Kitchen, Nature's Variety, Primal Pet Foods, Zuke's, Sojos, Dog Frozen Yogurt Social-from The Bear & The Rat and more! Photos from last year's Woofstock! See great photos from last year's Woofstock 2013!! FFR Fundraiser at Pasta Pomodoro March 20th, Thursday, all day! Dine in or To-Go at Pasta Pomodoro and they will donate 20% of your bill to Furry Friends Rescue. Prior to ordering, please present this flyer to their server. Get your furry sweetheart spiffed up for Valentine and year round! Purchase Pet Food Express "Pet Wash" tokens on Feb. 8, 2014 / Sat. Download printable flyer (Black and White) or color version of this event. Help us spread the word! Buy 10 Pet Wash tokens for $100! Receive a gift from FFR. Buy 3 and get 4th for free. Get a PFE Raffle ticket to win a Gift Basket of goodies with token purchase! Tokens can be used year round at any Pet Food Express location. 100% Pet Wash proceeds to FFR. Valentine on-site photographer. Get a photo print (4x6) of your sweetheart in a "Love" frame! $10.00 (We can also e-mail you the photograph for your keepsake). Valentine goodies & music, smooches, Honest Kitchen dog treats. Ho, Ho, Ho! Santa Paws is coming to town! FFR, Pet Photo with Santa Paws! Join us for a very groovy day of Wine Tasting, great live music, Howl-loween Dog Costume Contest and Woofstock fun with your pets! Wine tasting will be located at their outdoor plaza, boasting breathtaking views of the Silicon Valley. Enjoy the beautiful vistas of the Winery while dancing or listening to cool woodstock music from awesome live bands, Howl-loween Dog Costume Contest, Silent Auction, Raffles, Yappy Hour goodies for your dog, Dog Showcase and special guest artists/vendors. Mingle, relax and have fun!. Peace, Love and Rescue! Check out last year's Woofstock video! Entrance Fee: On-line tickets available! Entrance Fee includes: Complimentary taste of 4 Reserve Wines or soft drink. Wine, Beer, non-alcoholic beverages and food offerings will be available for purchase. Parking is FREE. Click the button above and click "Buy Tickets" button to purchase your ticket online. Coolest dog & people event of the year to help save homeless animals! Grooviest, Cutest, Unique, Funniest & Group! Grand prize for Best! Special Guest Emcee, Diane Dwyer, NBC Bay Area News! 100% Chiropractic San Jose - "On site Chair massage and Spinal Screening" donation to FFR. Special Thanks to Our Paw-some Sponsors!! Watch Last Year's Woofstock 2012! 2:30 pm Hawaiian Dancers!Tahiti Nui Dancers and Hui 'ilima of Santa Clara. Download this flyer and spread the word! Download this flyer in PDF.